In today’s hectic world, it’s easy to lose sight of the little things that bring you peace. It could be a hike in the woods, an evening with a great book, or maybe it’s something as simple as wearing a beautiful piece of jewellery. 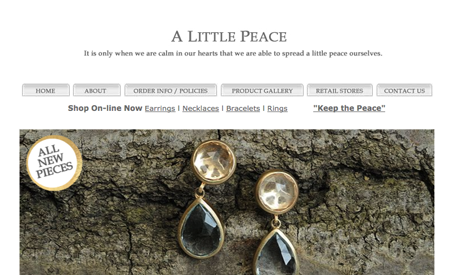 Teresa Saputo created her business, A Little Peace, with this is mind. Her one-of-a-kind handcrafted jewellery reflects the imperfections of nature (and life) through subtle, earth-toned colours and irregular designs. Jewellery, like life, doesn’t have to be perfect to special.